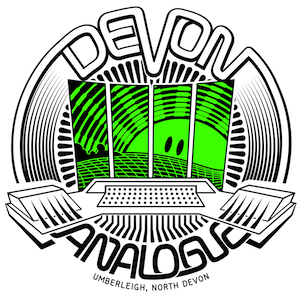 "Imagine a holiday home on acid..."
This is Devon Analogue - a bespoke recording facility in the Devon countryside with a collection of the best vintage analogue and digital instruments and outboard, megred within a loft styled living space; perched on a hill with views of Exmoor. The studio has been developed to allow artists to lose themselves within their project, be it writing, recording, rehearsals, production or mixing. We can cater for 4/5 people with full accommodation, wet room and kitchen diner, and when you want to get out for some fresh air you can be walking in a Devon forest within minutes. Complementing the luxurious feel of the studio is a high-end hybrid specification delivering the best of mastering-grade analogue/digital technology and vintage instruments, wrapped up within an effortless workflow design – which, matched with our calibrated Genelec system and DA/AD conversion, creates an amazing sound space and vibe. With recent clients including XL Recordings, the studio is currently working with artists from all realms of electronic music – although its doors are certainly open to other genres! Above all other considerations, the objective is to allow clients to take advantage of an unforgettable experience whilst working on their project – be it starting on brand new music or wrapping up works.